I had to go and get some groceries today, and whilst sitting in Lei’s Cafe at The Waterfront enjoying a coffee with no wife nor kids, I noticed a couple of people kept glancing furtive glances my way. Either I’m one scary looking guy, or they were working out if they had read my blog, and trying to figure out if it was me or not, and wondering if they should ask.. I answer so many questions, send lots of emails, and yet so many people rock up to Port Moresby and then never say Hi once they get here. 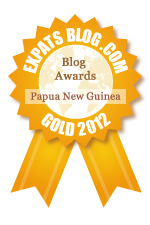 New Expat to Port Moresby? Portable hard drives. You never know when someone has that great movie collection, and you need to copy it. A great electronic movie collection – if you share, you make more friends! A good BBQ – at least 4/5 burner. Yes, you might have a small family, or just be a single – but trust me, a big BBQ is perfect for BBQ parties. A UPS for your electronic stuff, make sure it’s a good one. Black Tie for blokes, including bow-tie and ruffled white shirt. Ladies – maybe one cocktail dress, you can get plenty here in the 2nd hand shops so don’t go overboard. Squash racket and balls – refer 13. Good quality dive/snorkeling gear. Make sure that they are suitable for the tropics. Fitness gear if you have it.